The Cherokee Strip Regional Heritage Center in Enid is pleased to present Layered Lives, an exhibit running from January 15 to February 16, 2019, in the J. E. and L. E. Mabee Foundation Gallery. 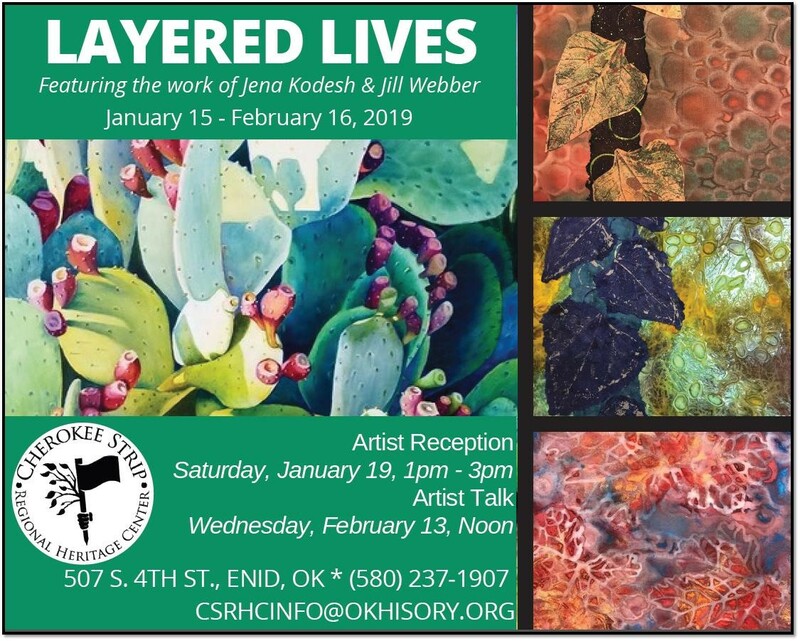 The exhibit features the artwork of Oklahoma artists Jena Kodesh of Tonkawa and Jill Webber of Stillwater. An artist’s reception to celebrate the exhibit opening will be held on Saturday, January 19, from 1 to 3 p.m. A Brown Bag Lunch and Learn lecture featuring a conversation with the artists is scheduled for Wednesday, February 13, at noon. Both events are free and open to the public. The Layered Lives exhibit is included with regular museum admission. Jena Kodesh, a graduate of Oklahoma State University, holds a Bachelor of Fine Arts degree with double majors in Studio Art and Art History, along with a Master of Arts degree in Education. Kodesh is a graduate of the Oklahoma Leadership Arts Program and a recipient of the Governor’s Arts in Education Award. After completing National Board Certification, Kodesh began instructing two-dimensional art and art appreciation classes for Northern Oklahoma College. She is currently an honoree of the Journal Record’s 50 Making a Difference and a 2018 candidate for Oklahoma Woman of the Year. She enjoys promoting the arts and arts education across the state. Her artwork validates a love for organic form. Jill Webber is a newcomer to the fine art scene, having spent her career teaching high school art. She loves to capture the beauty of simple things people pass by every day, especially views in nature and in surrounding landscapes. In order to find the material for her paintings, she oftentimes hikes around in wooden areas or in the mountains in northern New Mexico. She enjoys observing how the time of day and the changing of the seasons can alter the beauty of a certain area or object. During the past three years, Webber also became one of the five founding members of the Art Advocates, a volunteer group dedicated to supporting the OSU Museum of Art in advancing art and art education in the Stillwater community. She is presently serving as a co-chair for this year’s events. In addition, Webber serves on the Selection Committee of Modella Art Gallery. The Cherokee Strip Regional Heritage Center is open Tuesday through Saturday from 10 a.m. to 5 p.m. and is located at 507 South Fourth Street in Enid. For more information, please call 580-237-1907 or visit www.csrhc.org.